Last week, some incredibly talented students at our high school put on an evening of one-act plays. I was particularly excited to see A Charlie Brown Christmas, and I was not disappointed – I was so impressed by how well the kids brought the classic cartoon to life. However, the play that really gave me some food for thought that night was A Straight Skinny: a story about a high school algebra class that had been caught cheating on a midterm exam. What stuck with me most was one of the character’s monologues, which centered on the uselessness of the quadratic formula. When would we ever use it in real life? Why do students even have to learn this sort of nonsense if they’ll only forget it once the final exam is over? (I wish I had recorded the speech – it was much more acerbic, and much funnier than how I’m describing it.) It so happened that one of my Foundations 20 students was sitting two seats away from me… and – coincidence or fate? – we were learning about the quadratic formula that very week. Once you graduate high school, you’ll probably never think about the quadratic formula again. Or maybe you will, if you decide to study business, or engineering, or any field that requires you to take some university math courses. But that’s besides the point. Do you think in a job interview you will be asked to discuss the symbolism in Hamlet’s soliloquy? Do you think you will need to know the date that Marie Antoinette was sent to the guillotine? Probably not. But this is not why you are studying Hamlet or the French Revolution. In each case, you’re learning to see and understand the world around you in a different way, which is a valuable undertaking in and of itself. In both of those classes, the most valuable skills you are gaining are not memorization and regurgitation, but rather critical thinking, analysis, and reasoning. The same goes for math. Personally, I don’t care if you can recite the quadratic formula once you graduate. What I care about is whether you can ask good questions, identify the important information and the tools needed to solve a problem, construct a sound argument, create a model… These are skills that are worth developing; these are the skills that will hopefully stick with you much longer than the quadratic formula. It’s not perfect – I’m sure I’ll be tweaking it for years to come. It’s too bad that our society has given students the idea that everything we do should look good on our resume. Now, there’s no way around it: math skills are important for today’s job market. But if we can also help our students see the music in math, then I think that we will have truly succeeded. P.S. I would love to hear from you: What is your math elevator pitch? How has it changed over the years? Thanks for writing this. Something I’ve been wondering is what this looks like in lower grades. Algebra I is where (in my opinion) math teachers start losing the argument that math is useful in the “real world”. Not that it’s wrong, but becomes neither necessary nor sufficient for convincing students to engage in math class. But does that mean that a 7th grade teacher doing ratios and proportions and simple equation solving, full of real life applications, should be justifying his class through its real world applications? Does the argument that you made land with younger students? 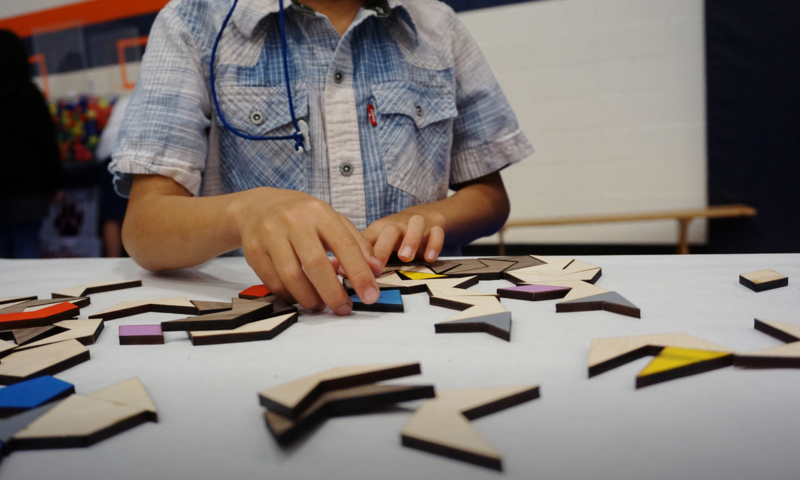 It seems to me that younger students have more natural curiosity, and there are more mathematical questions that are accessible to students with a wide range of abilities. Should we be capitalizing on that, or selling them on the “real world”? I taught 6th grade a few years ago, and was very guilty of the “real world” selling point — and, based on my experience, it worked. I just don’t know if it was the right thing to do for those students mathematical futures. That’s an excellent question, Dylan – one that I don’t have a good answer to, since I have little experience teaching mathematics at the elementary level. I would have guessed that younger students – who (hopefully) haven’t yet had it drilled into them that the “real world” is all about jobs and marketability – would be much less likely to ask this question, especially if they’re working on interesting and challenging problems that give one satisfaction just from having solved them. But of course they could (and should) still ask why they should learn how to multiply fractions, do long division, etc. I do agree that it’s much easier to make real-world connections with elementary school concepts, and I think this would probably also factor into my elevator pitch to younger mathematicians. However, if that’s the only message they ever receive – that math is only relevant if you can see it in the “real world” – then I’m guessing they’ll find it much more difficult to buy into Algebra, etc. in high school. Thanks for your comment, Tina! It’s so great to get different perspectives on this. I can imagine how, e.g., the quadratic formula might be an even tougher sell among your students. I think the emphasis on building problem-solving skills is key. I came across mention of your post on Twitter, so came here to read more. You make many excellent points. I am sure everybody, both students and teachers, have asked themselves the same question– for all their courses. I suppose the short answer is that nobody knows the future, so older people, with more life experience (teachers, parents, planners, politicians, etc,), try to make the younger people (children, students, etc.) as well-rounded as possible. Speaking from my own experience, I didn’t decide on an advanced degree until about Grade 11. So having the proper groundwork laid out by then saved me from make-up work. Before making my decision, the life decisions were (i) go work at the local mill, in which case, a high-school diploma was already too much education, or (ii) continue on to university, in which case, the high school diploma I was getting wasn’t quite enough (it was a small school in a small town with a few courses unavailable.) You can’t make everybody happy, so the education field takes a middle ground. Since then, I have had several jobs, traveled a lot, moved, taken night-school courses, etc. Life has many twists and turns and there is no way to predict all the paths people will take. Even if a person starts out thinking they will do something for the rest of their life, it rarely works out that way. I think secondary schools base their policy on the assumption that nobody knows the future, so try to cover as much ground as possible, and as students move toward their chosen direction, to help them build the proper foundation. Maybe knowing the quadratic equation won’t help them get a job. But come to think of it, before the Industrial Revolution, nobody got an education for the sake of employment. People wanted education for enlightenment. Knowing how to read made the populace less dependent on a few elite. On the other hand, today many jobs do depend upon strong math skills: engineers, scientists, computer programmers, game developers, etc. Those fields all require math skills WAY above and beyond knowing the simple quadratic equation. Learning is about making ourselves better, and we should be constantly working to that goal. I’m wondering if this parallels your views, or if I’m off the mark.